Praised as ''elegant'' in the Boston Globe and ''extraordinary'' by the New York Times, Scott Andrews has been critically acclaimed in solo and chamber music performances across the country. A sought-after collaborative musician, Mr. Andrews has performed with many of today's leading artists, including Jaime Laredo, Robert Mann, Christian Tetzlaff, Kim Kashkashian, and Ursula Oppens. An avid proponent of new music, he has performed with organizations such as Composers in Red Sneakers, the Auros Group for New Music and Boston Musica Viva. Mr. Andrews has appeared as a solo artist with the Ying String Quartet, the Calyx Piano Trio, and the Boston Symphony Chamber Players among many others. As Principal Clarinet of the St. Louis Symphony since 2005, Mr. Andrews has appeared each season as a concerto soloist, most recently with David Robertson conducting Aaron Copland’s Clarinet Concerto. 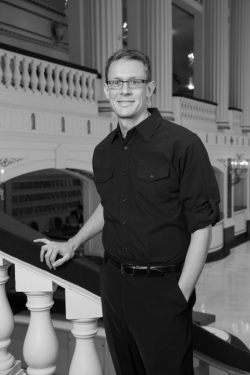 Before joining the Saint Louis Symphony, Mr. Andrews had been a member of the Boston Symphony Orchestra for 11 years and has also performed with the Philadelphia Orchestra and the Saito Kinen Orchestra. He has lectured and given classes throughout the United States as well as in Europe and Japan. Mr. Andrews was for many years the Woodwind Department Chair at Boston Conservatory and a faculty member of the Tanglewood Music Center in Lenox, Massachusetts. He collaborates regularly with Seiji Ozawa in Japan at the Saito Kinen Festival and as Solo Clarinet of the Mito Chamber Orchestra. Originally from Virginia, Mr. Andrews studied piano and violin before discovering the clarinet, studying with Edward Knakal of Virginia Beach. He attended the Virginia Governor's School for the Arts and also studied at the Interlochen Music Center in Michigan. He graduated with distinction from the New England Conservatory of Music where he was a clarinet student of Harold Wright.